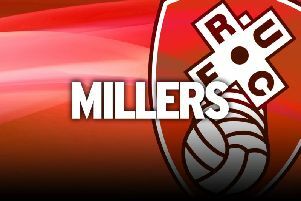 The striker penned a new two-and-a-half-year deal last week, meaning he will be staying with the Millers until at least 2021. It has been anything but plain sailing for Proctor in his first 12 months at the AESSEAL New York Stadium as he suffered a cruciate ligament injury in just his sixth appearance that wiped out his 2017-18 campaign. He made a dream return to action this season, but has since suffered more frustration after picking up a groin injury. Boss Paul Warne has taken a huge leap of faith to offer the 26-year-old such a lengthy deal and the former Bolton man is determined to repay it. Speaking exclusively to the Star, Proctor said: “The gaffer came to me and told me he was looking to tie me down and that he wanted me to stay. “It was something that as soon it was mentioned it to me I never considered not staying. “As soon as the contract was offered there was no doubt in my mind that I wanted to stay, simply for the fact that the gaffer has shown a lot of faith in me. Approaching his late 20s, Proctor should be about to hit his peak and he reckons he has found the right environment to be able to show his best football in the coming years. “The gaffer knows that if player are settled and they are not worrying about contracts and their futures then they are going to play their best football and that will certainly happen with me,” he added. “I can now focus on getting as fit as I possibly can and get back to playing to my best. “I'd like to think they will be the best years of my career, I certainly feel like with the manager and staff we have got I feel like it is the right club for me, the right set of lads, it is the perfect environment.